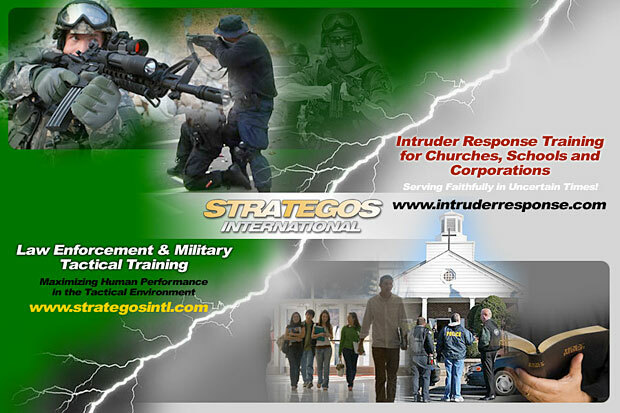 Kansas City-based Strategos International combines aggressive tactics with biblical teachings to empower church flocks to become their own security force, able to defend against everything from domestic violence to Jihad to the shocking act in Richmond, CA. The attacker is seated in a back row of the church. He’s wiping his palms nervously on his jeans. His body is rigid on one side from the effort to conceal a nine-millimeter handgun. He’s sweating, fixated on the preacher. All are telltale signs of trouble, but the room is filled with distractions: people coughing, cell phones buzzing, parishioners arriving late. Amid the bustle, the attacker pulls his gun, strides nearly 15 yards to the pulpit, aims dead at the preacher, and pulls the trigger. “Bang! Bang! Bang! Bang!” he screams before the God Squad reacts–four undercover agents. It’s supposed to be their job to spot the bad guy and send him off to meet his Maker. Finally, someone yells, “Gun!” One man grabs the weapon while another bear hugs the attacker from behind; the rest dog pile, wrestling him to the ground. It’s a scene startlingly similar to the shooting on Feb. 15 in Richmond, Calif., where two gunmen in black hooded sweatshirts burst into the New Gethsemane Church of God in Christ and shot two brothers, 14 and 19, in the leg and shoulder and sent almost 100 parishioners scrambling for cover. But this time, it’s all a simulation. The gun is fake. The bad guy and his subduers are all participants in a program created by Vaughn Baker, who stands aside wearing a black polo adorned with his company’s logo–a masked gunman in front of a bulls eye target–and cargo pants. He folds his thick forearms across his chest and barks orders like a drill sergeant. “This is your house. This is your family. If someone comes in here, they are going to have to go through you,” he says, rallying his warriors, a congregation of about 30 middle-aged, Middle-American Methodist men, scattered among the pews of a small chapel in rural Missouri. Baker is the president and founder of Kansas City-based Strategos International, a company that combines aggressive tactics with biblical teachings to empower church flocks to become their own security force, able to defend against everything from domestic violence to Jihad to the shocking act in Richmond. For two days in a recent session, the one-time SWAT point man runs the equivalent of a Bible-based boot camp, molding a motley crew of cops, Vietnam vets, and gung-ho construction workers into a security detail physically and spiritually fit to defend a church from assault. Strategos was founded in 2002 after Baker retired from duty to run special training sessions for military and law enforcement agencies. His original plan was to focus on helping schools avoid the next Columbine–by his estimates, the total number of schools (119,000) was far bigger than the total number of law enforcement agencies (45,000). The problem: State agencies don’t pay well. A recent contract with the state of Missouri brought in less than $500,000 to teachers for a four-year gig with 32 training sessions per year. But churches, especially of the Mega variety, are more numerous (375,000 total congregations) and have much deeper coffers. While he won’t release exact financials, Baker says Strategos earns somewhere in the low seven figures, most of it from their religious services, which have grown from nothing in November 2008 to account for more than 35 percent of their business. They run regional seminars ($175 per person per day) as teasers for longer private security boot camps (with group rates) like the one the Methodists signed up for. He estimates they trained 1,400 people at 350 churches in 21 states last year, plus signed more contracts for refresher courses. While he also makes a small dividend from referring congregants to fight gear companies like Tazer, Baker’s next theater is the Internet. In January, he launched WorshipSafe, a $399-a-year, subscription-based online security software program that offers templates for designing everything from your protectionist philosophy to blueprint-specific battle plans. For he is God’s servant, an agent of wrath to do you good. But if you do wrong, be afraid, for he does not bear the sword for nothing. So Baker teaches the congregation how to recruit a security team of off-duty cops, military folk, and Good Samaritans. The Good Samaritans, acting as greeters or parking lot attendants, become lookouts, using tactical ear pieces to relay suspicious behavior to their colleagues. Once the service begins, the group fans out in tactical formations to monitor the crowd. Baker leaves it up to each parish to decide if and when the security team gets to pack heat. He also offers guidance on the liability issues. Eric Spacek, a senior risk manager at GuideOne, a church insurance agency, estimates that about 40 percent of his 43,000 clients have some sort of informal security program to manage collection deposits and nursery school background checks. But interest in armed protocol has skyrocketed since 2007 when an off-duty female police officer shot and killed an assailant armed with an AK-47 and 400 rounds of ammo at New Life Episcopal Church in Colorado Springs. 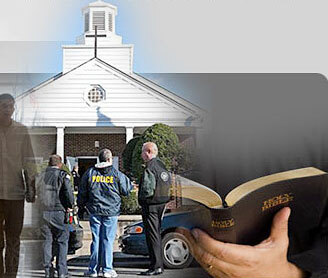 Bob Whisman, a retired FBI agent, who started his own security force at the 15,000-head Church of the Resurrection in Overland, Kansas, says he doesn’t mind telegraphing to suspicious-looking visitors the fact that his ministry is locked-and-loaded. “We want people to know that if they make threats to this church, whatever they do is at their peril,” he says. The danger of course is becoming too much of an avenging angel. Vaughn Baker readily admits that his passion for force once exceeded his passion for scripture. After earning his police badge in 1988, he says, he began to “backslide,” missing Sunday services. When he was on the street collaring crooks and collecting commendations for valor, the notion of turning the other cheek seemed quaint. That all changed when a former SWAT-team-member-turned-pastor invited him to serve on an in-house security force. “I learned that you can be both a Christian and a manís man,” he says.